The Museum of Cécile Gambini Two exceptional guided tours of the Victor Brun Museum conceived and animated by the 2019 laureate of the residence of writing "A natural history", Cécile Gambini: First visit: from 15h to 16h Second visit: from 17h to 18h East you know that in the museum a beautiful crocodile has been hiding in the attic for years? That a very discreet explorer had amassed a treasure in the form of boxes, vials, semi-precious stones from all over the world? That part of the sun was exposed here? Cécile Gambini offers a magical stroll through the hidden treasures of the Museum, an imaginary journey for a visit, let yourself be guided! 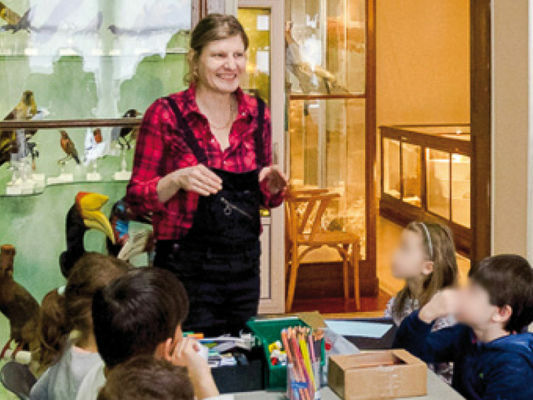 For this third public meeting of the writing residency "A natural history", the author-illustrator Cécile Gambini, proposes to the public to follow it in its unusual and offbeat discoveries of the forgotten curiosities of the Museum Victor Brun de Montauban ( 82). Free on reservation with the Victor Brun Museum: +33 (0) 5 63 22 13 85 Limited places. Information on www.confluences.org/residence or www.mediatheque-montauban.com or www.museum.montauban.com The residence "A natural history" is carried by the association Confluences and the direction of cultural development of the City of Montauban (Victor Brun Museum and Mémo Media Library) jointly with DRAC Occitanie.